First of all, Hakata is a city in Fukuoka prefecture, Japan, where world-wide famous tonkotsu-ramen shops have originated. It is also a city with a variety of local delicacies that many people keep going back for. 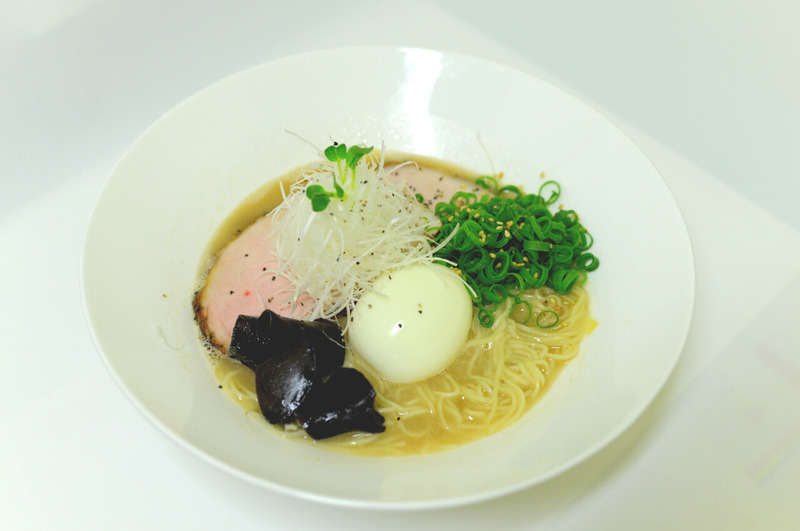 In this article, let’s focus on tonkotsu-ramen, and especially its noodles. For those of you who are not familiar with tonkotsu (meaning “pork bones”) or Hakata-ramen, it is a hot noodle soup dish with creamy, white and rich broth (there are variations to the level of richness) that is cooked from pork backbones, head, and certain other ingredients. The noodles are typically very thin, white, and hard in texture (the size varies, but it usually ranges from 1.1 mm to 1.3 mm), which gives Hakata-style noodles their distinctive crunchiness and unique bite. Because they are very thin, Hakata noodles get soggy fast in hot soup. provide customers with options of how they’d like their noodles to be cooked (bari-kata/extra hard – 10 seconds; kata/hard – 20 seconds; normal – 30 seconds; yawa/soft – 45 seconds, etc.). Cooking time for each option may vary from shop to shop. 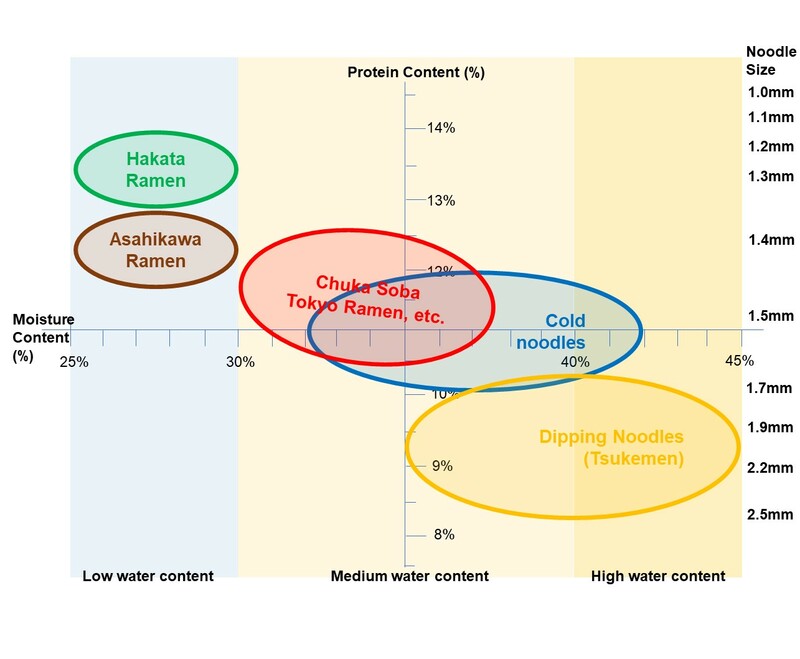 As Hakata noodles quickly lose their firmness once put into soup, to let customers enjoy their texture, portion size is usually made small on purpose (usually 80-100 grams). Then, the restaurants encourage customers to order extra portions of noodles - they eat up a small portion of noodles fast, and enjoy another portion in the same soup. How can we make authentic Hakata-ramen noodles? To see what ingredients are proper for this type of noodles, let’s review the features of Hakata-style noodles. First, they are hard and crunchy, and are made from flour with high protein content, and other ingredients, such as gluten and egg whites which serve as hardening agents. Egg whites are also used to make noodles more water resistant - thus allowing them to keep their texture longer in hot soup. There are wheat flour brands specially designed for Hakata-ramen noodles, but the type(s) of flour available outside Japan are limited. So, try to find flour that is high in protein but low in ash content (which makes noodle color darker). 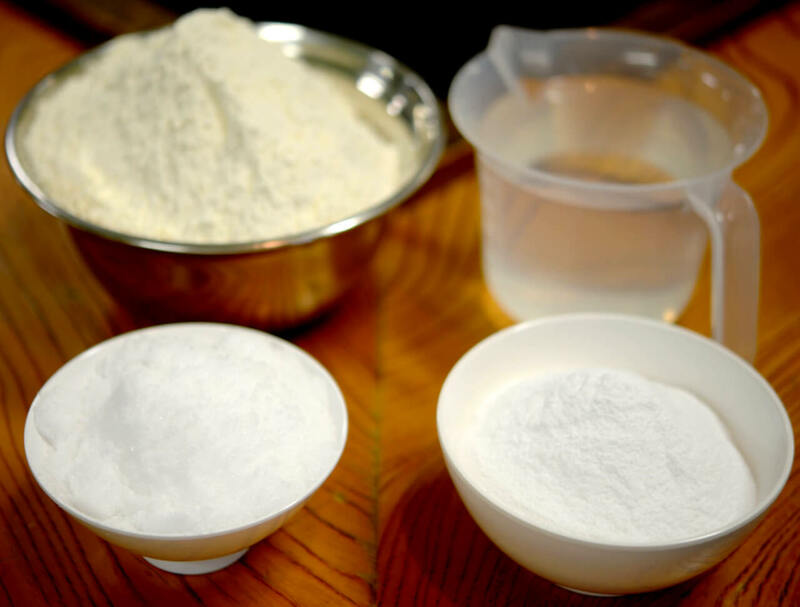 there’s another point to consider – the less water added to flour, the harder the texture would be (so, reduce the amount of water/liquid added to flour in mixing process). It varies, but water should be 25-28% to the weight of flour/solids. Other important ingredients are kansui (there are many types, but the most common one is a combination of potassium carbonate and sodium carbonate) and salt. These two are solids that need to be dissolved in water before adding them to flour during mixing. We use a commercial noodle making machine to make this type of noodles (it is very hard to make it on a pasta machine or by hand because of its firm texture which requires strong pressure to form the dough). First comes mixing of the dough. The ideal mixing time is 15 minutes (the basic rule is this: the less water/liquid, the longer the mixing time). Even after adding all liquid, the dough is still powdery, and can best be described as ‘wet flour’. Adding potassium carbonate gives its color a slightly yellowish tone. Next, we would need to take the dough, and feed it into rollers to make a rough dough sheet. At this stage it is still fragile, so we would next need to split the sheet into 2 reels, and feed them into rollers to combine them together. This process strengthens dough. Usually, it is repeated twice. 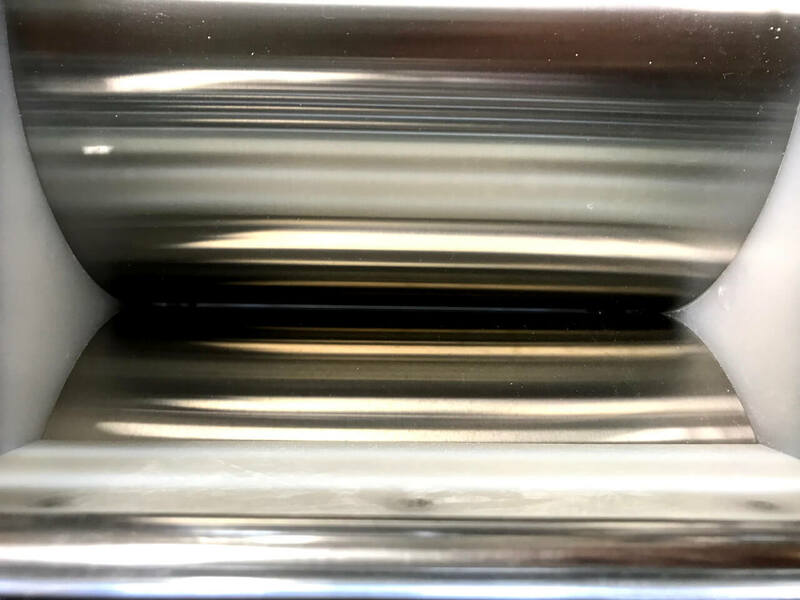 Because of the gluten structure developed and nurtured in dough, thinning process should be gradual not to damage the structure (which provides great texture) by thinning the dough sheet drastically at once. Thin dough sheet gradually a couple of times to certain thickness (thin enough to cutting). use a slitter cutter (1.1 – 1.3mm) to cut dough sheet into noodle strands. The machine cuts and portions noodles automatically to the same length (portion size: 80-100 grams). Put a cover on the noodles to keep them from drying. Refrigerate the noodles for storage. The noodles should keep for one week. Prepare boiling water (at least 10 times the weight of noodles you’re cooking). Make sure the water is rolling boiling before putting the noodles in a basket. 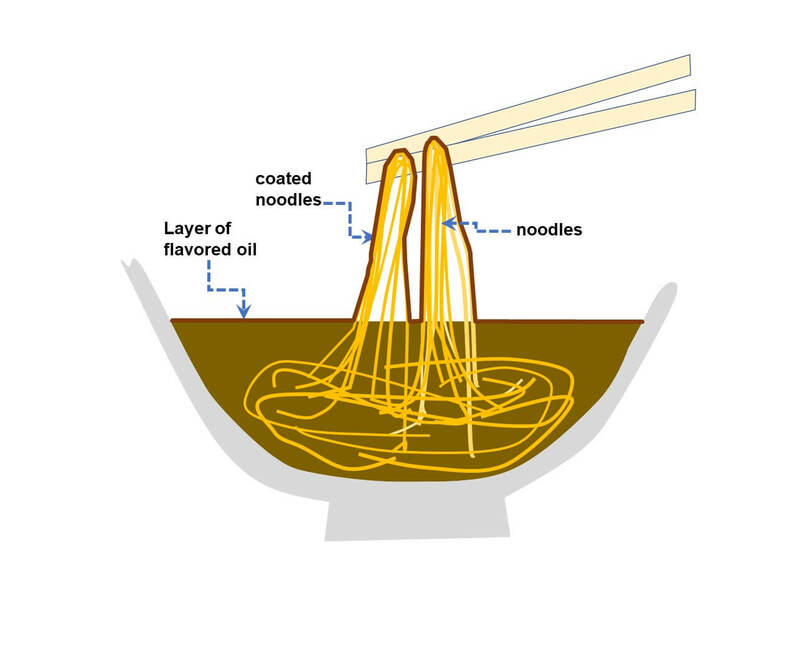 Boiling water is critical in cooking of the noodles because the noodles would not get gelatinized without proper temperature, resulting in uncooked noodles and poor texture. (ideal temperature – 98.6 degrees Celsius or about 210 degrees Fahrenheit. Top it with proper garnish and other toppings, etc. and serve it to your customers. Now you can call yourself a noodle master of Hakata-ramen.